Swansea, UK February 2017: At BVE and CABSAT 2017, Quicklink will show their new, ground-breaking Remote Communicator solution. The Remote Communicator which was launched in January 2017 allows you to stream real time, full duplex ultra-low delay audio/video or audio only that is sent and received from a single web browser, enabling broadcasters to create high quality, ultra-low latency video and audio contributions. The Quicklink Remote Communicator is a complete versatile solution that can be used on Quicklink hardware or installed on the users own hardware. The new solution includes cloud advanced firewall punch through with automatic fall back to Quicklink Relay Services guaranteeing connectivity on the most challenging and secured networks. 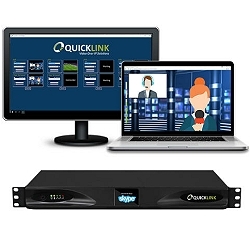 Quicklink will also be showing their popular TX Skype call transceivers at BVE and CABSAT. Designed in partnership with Microsoft, the TX Multi is a Skype video call management system that allows for multiple calls within a single hardware unit. The Quicklink Remote Communicator and TX Multi will be showcased at BVE 2017, Excel London (stand E37) from 28th February – 2nd March and CABSAT 2017, Dubai World Trade Centre (stand I2-35) from 21st-23rd March. Visit the Quicklink stands to see the solutions in action.